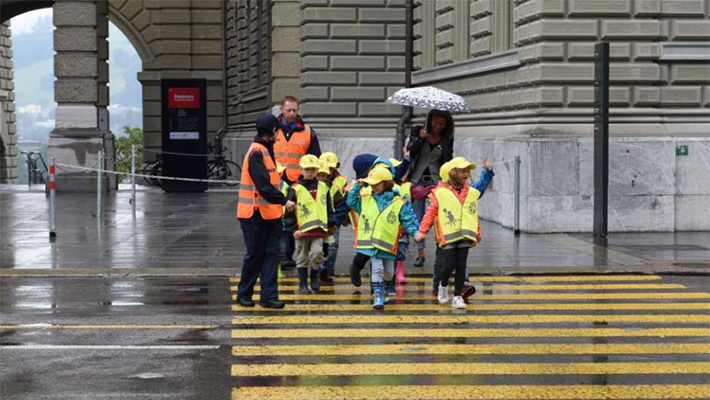 Next or next week many children start in Switzerland in kindergarten or at school. Some of them may be traveling alone as pedestrians on their own for the first time. Therefore, the police, the TCS and the Advisory Center for Accident Prevention BFU ask motorists for greater vigilance. With the safety campaign “Road stands, the child goes”, the partners want to sensitize motorists and provide children with a safe way to school. The principle is simple: motorists should stop at pedestrians – especially when children are waiting. Because they learn in school, only to cross the street when the car is complete. Before the motorists can stop, they have to see the children as well. Especially at dusk, this is not always easy and in bad weather even more difficult. In the dark, pedestrians in dark clothes are only recognized when they are only 25 meters away. With reflective clothing, passers-by can be seen from 140 meters. For this reason, the TCS has distributed reflective belts to kindergarten teachers and students aged four to seven since 2013. Larger primary students (eight to nine years) receive safety vests. Every year, the TCS distributes around 140,000 belts and 80,000 vests with reflective fabrics to children throughout Switzerland.